Rose cream(7 pt. ), Eustoma white(3 pt. ), Lily pink(2 pt. 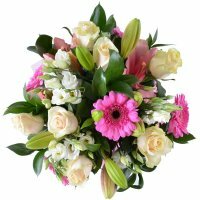 ), Gerberа pink(5 pt. ), Greens(1 pt. ), Packing(1 pt. ), Tape(1 pt.). Birthday, Colleague, For her, For young lady, Gratitude, I Miss You, New-born, Sorry, Wedding flowers, Аnniversary. 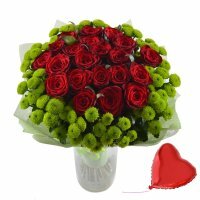 This bouquet is as sweet as a young lady. 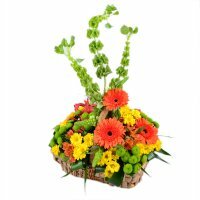 Crimson gerberas get on swimmingly with true queens of the flower world – roses and lilies. They shine like the stars. 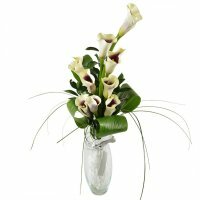 The flowers breathe with purity, tenderness and charm. They bring joy and cheer up the young lady of any age from 10 years and older. 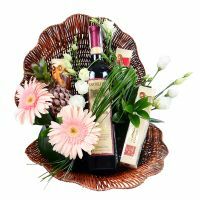 This bouquet will be a good present for a daughter for her 16 or 18 years old party. It will be a good gift for a fiancée on the day of engagement. 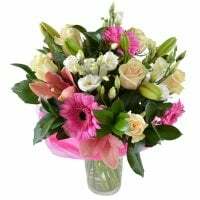 Even just a friend of yours will be pleased to get such charming flowers, the embodiment of tenderness and grace, on her Birthday. Attention: the bouquet may differ from the image. 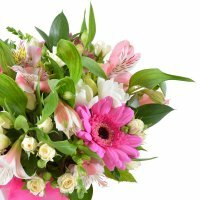 Florist may change colors of bouquet.